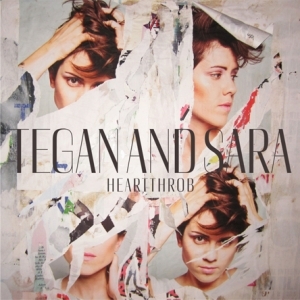 This week, I’ve had Tegan and Sara’s latest album, “Heartthrob” spinning out of control in my car, making my commute to and from work absolute heaven. I’ve been a fan of these gals for some time (I’ve seen them live three times – yep, I might be bragging), but their latest contribution just might be my favorite. Which, is saying something. A good friend of mine (shout out to Sandi) was already a big Tegan and Sara fan and proceeded to conduct my education. I’ve got so many favorites and perhaps I’ll have to devote a Music Friday to sharing a top ten list (as impossible a task as that seems). Today, though, I want to spend more time on Heartthrob. It seems rare these days that I get a new CD where there isn’t at least one song I feel like skipping. But, every song on this album is amazing. The lyrics (which the girls have always been rather adept at writing) are so powerful. A couple of the “break-up” tracks, like “How Come You Don’t Want Me,” and “Now I’m All Messed Up” are heartbreakingly awesome. They’re songs you can really sink your teeth into. Any other Tegan and Sara fans out there? What are your favorite songs?